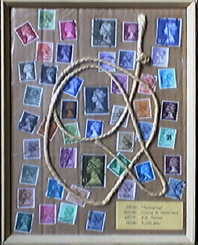 Works of art set around the theme of objects which have passed through the postal system, or have the potential to follow this route, may take many forms. These are some of the ideas that have occurred to RAF members. All colours are described in terms of the Michel Farbenführer. The composition has a dust-covering of clear polythene. This almost legendary work disappeared from view for a number of years and it was out of sight long enough to acquire an almost mythical quality as regards its content. The collection consists of 106 covers, all of which have made a journey through the British postal system and it spans the period when the inland second-class postal rate was 11½p. 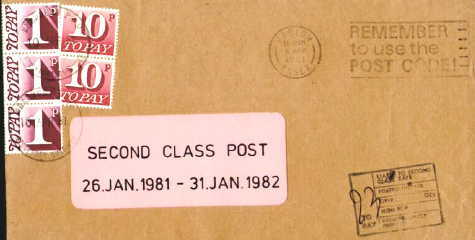 The collection opens with an unstamped cover bearing 23p in postage due stamps and continues with a cover bearing a 10p stamp, which sneaked through the system after the rate was changed, and then 2 covers each bearing a regulation 11½p stamp; one obsolete and one the new definitive. And then the fun starts. 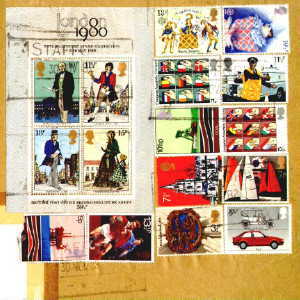 The creator of the collection proceeded to use every possible combination of ½p and 1p stamps possible going from a cover bearing 23 x ½p stamps to one bearing 11 x 1p stamps and a single ½p stamp. And then he does it all over again with ½p and 2p, 2½p, 3p, 4p, 5p and 10p stamps [the low values in use at the time]. He then moves on to a bewildering array of combinations adding up to 11½p which, we are assured, is comprehensive. 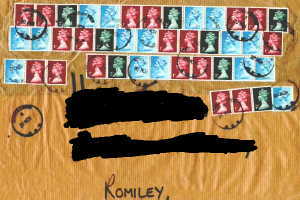 Anyone interested in such things could use the collection as the basis for a study of how often letters go through the postal system without collecting a franking; and where to put stamps on a multiply stamped envelope to ensure that they do not collect a franking and remain postally re-usable. Given a lot of standard definitives or a modest collection of commemoratives, and a lot of space on a parcel or an A4 mailing, the philatelic artist can create a cover which will impress the fortunate recipient and the postman. But this art technique has to be approached with a degree of caution. It is not unknown for particularly splendid creations to disappear into the postal system, especially if they are going abroad, and never reach their destination. Rogue postal employees are not above creating collections of other people's mail.